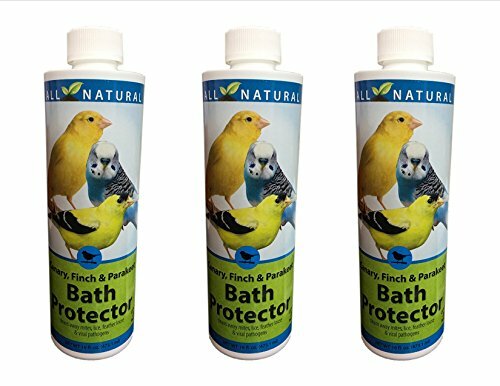 3 Pack 16 oz Canary, Finch & Parakeet Bath Protector is an all natural solution to cleaning away fleas, mites and lice. The all natural solution cleans away parasites without the use of harsh and harmful chemicals. Laboratory studies have shown that parasites effect the health and performance of birds. Body weight, feed efficiency and general health are poorer in birds that are exposed to even small amounts of parasites infestation. Birdbath: Pre-mix one (1) ounce* of product per one (1) gallon of water dispense in birdbath. This is a non-hazardous product and requires no special handling dispose of in a sanitary manner. Care Free Enzymes 3-Pack Birdhouse, Nesting Pocket & Gourd Cleaner Spray Bottle 16 oz. Care Free Enzymes 3-Pack 3B Protector Spray Bottle 94721D 16 oz.